Last year I launched an irregular series here on Crime Watch, "I Can't Wait to Read", which features myself and some great guest bloggers highlighting crime novels that we're really looking forward to reading. Today I'm showcasing the upcoming thriller from one of the southern hemisphere's finest crime writers. Jerry Grey is known to most of the world by his crime writing pseudonym, Henry Cutter - a name that has been keeping readers at the edge of their seats for more than a decade. Recently diagnosed with early onset Alzheimer's at the age of forty-nine, Jerry's crime writing days are coming to an end. His twelve books tell stories of brutal murders committed by bad men, of a world out of balance, of victims finding the darkest forms of justice. As his dementia begins to break down the wall between his life and the lives of the characters he has created, Jerry confesses his worst secret: The stories are real. He knows this because he committed the crimes. Those close to him, including the nurses at the care home where he now lives, insist that it is all in his head, that his memory is being toyed with and manipulated by his unfortunate disease. But if that were true, then why are so many bad things happening? Why are people dying? 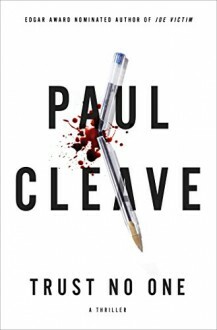 Over the past decade, Paul Cleave has become the dark prince of antipodean crime writing. He shot to international fame with the publication of THE CLEANER, which was a smash-hit in Germany, topping sales charts alongside Lee Child and Stieg Larsson. The English-speaking world took a wee while to catch up, but now as his ninth book looms, Cleave is a critically acclaimed international bestseller published in a dozen languages, more than 20 countries, has been a #1 bestseller in three countries, won prestigious awards in France and New Zealand, and also been a finalist for the Ned Kelly, Edgar, and Barry Awards. You can read more about Paul Cleave at his website. I've been a fan of Cleave's writing since I stumbled over CEMETERY LAKE in Papatoetoe Library in late 2008, having just returned from a yearlong round-the-world adventure. That book, along with Vanda Symon's THE RINGMASTER, kick-started this whole 'Kiwi crime' thing for me, from reviewing to features to this blog, appearing at festivals, chatting on radio, and creating the Ngaio Marsh Award. But the cool thing is, that Cleave has never disappointed me. He fast became one of my 'must-buy' authors, and unlike some other former favourites (where often as a series progresses, there can be blips or a slide from excellent to formulaic or "enjoyable but not quite so good anymore"), he's continued to thrill me with every single read. He's a writer who just seems to get better and better, and every time I've opened one of his books the past few years, whether BLOOD MEN (2011 Ngaio Marsh Award winner), or COLLECTING COOPER, THE LAUGHTERHOUSE, FIVE MINUTES ALONE and more, I've been absorbed into a darkly hypnotic tale. His writing has a fresh edge to it; one of those authors where you can immediately tell within a few pages that this is on another level to most of the other good and readable crime writers out there. TRUST NO ONE is something of a departure for Cleave - a true standalone (perhaps his first since BLOOD MEN - other books have had Joe Middleton or Theo Tate front and centre). But it is still set in Christchurch - so I'm curious to see how he'll deliver this tale - and will other familiar characters pop up in minor roles? One cool aspect about Cleave's writing is he has built this world, a fictionalised version of Christchurch, in which his characters operate. Major characters in some novels turn up as minor characters in others, even his standalone stories have links in time and space. There's also the writer-as-character aspect, which one of Cleave's heroes and influences, Stephen King, does so well. I'm very curious to see what Paul Cleave does with Jerry Grey/Henry Cutter. Publisher's Weekly raved about this book in a starred (p)review, and for all the reasons above it is arguably my most highly anticipated release of the year. It will be released in the United States in hardcover on 4 August 2015. Available for pre-order. Here's the Amazon link, but you could support your local bricks-and-mortar bookstore and order it there. I'm making my way through a galley copy now! It is definitely an interesting spin on the genre.